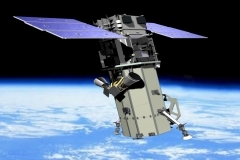 WorldView-2, launched October 2009, is the first high-resolution 8-band multispectral commercial satellite. Operating at an altitude of 770 kilometers, WorldView-2 provides 46 cm panchromatic resolution and 1.84 meter multispectral resolution. WorldView-2 has an average revisit time of 1.1 days and is capable of collecting up to 975,000 square kilometers (376,000 square miles) per day, more than tripling the DigitalGlobe multispectral collection capacity for more rapid and reliable collection.